“If truth is what we are all after, why would any scientific organization object to an independent look at the claims of the climate establishment?” climate scientist John Christy said. Christy has testified on the value of “red teams” for climate science many times in the past decade. This time, however, environmentalists and “consensus” scientists are worried Congress will take him seriously. 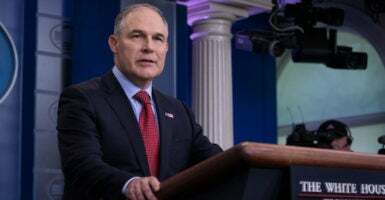 Red teams would challenge blue teams on global warming hypotheses on “what do we know, what don’t we know, and what risk does it pose to health, the United States, and the world,” Pruitt told Breitbart. The military commonly using this method to challenge strategies and improve their overall effectiveness. Many climate scientists, however, say it has no place in their field. After all, 97 percent of climate scientists supposedly believe humans are the main cause of global warming. “Science already has a red team: peer review,” David Titley, a climate scientist and retired rear admiral in the U.S. Navy, told The Washington Post. Consensus scientists say the red team setup could manipulate public understanding of the science, giving a false impression of uncertainty and delay action on global warming. Skeptics, like Christy, say the other side is afraid the method will expose the weakness of the supposed “consensus” on global warming. Consensus scientists say peer review works just fine, but skeptics point out the problems with climate models and many of their predictions. In fact, many articles have been written about the problems with scientific journals and peer review. Climate scientist Roger Pielke Sr. says peer review has become politicized, where “gatekeeping” plays a role in who gets published and who doesn’t. Skeptics usually get the wrong end of that deal. Pruitt can only do so much to change how the EPA conducts research, and it’s uncertain how much traction this idea will gain in Congress, especially with other major issues, like the Russia investigation and Obamacare repeal, sucking up political capital. “I can understand why political organizations would object—because their deeply held beliefs may be shown to be in error and thus set a foundation to undo their attempts to set rules for the ‘hoi polloi,’” Christy said. “Claiming that the truth has already been determined regarding ‘climate change,’ and thus red teams are not needed, is an argument made by someone who has not examined the theory,” he said.